Luz Cat Pin Also available as a magnet! Part of WhimsiClay's Glamorpuss collection, Luz is poised to pounce into your heart with her classy black & white details including feather boa, black diamond crystals, black pearl whiskers, and mother-of- pearl lustre glaze. Whimsiclay's Luz cat pin measures 2-1/8 x 3/8 x 2-3/8 inches. 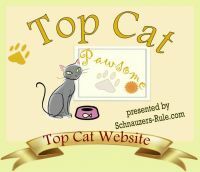 Makes a fun gift for any sophisticated cat lover! Once artist Amy LaCombe's current supply of these pins is exhausted, this design will retire, so act quickly if you want one! Collect them all, while they're still around! Shop all our collectible WhimsiClay items here!